DS Castlevania: Order of Ecclesia (USA) "Albus mode" in 18:03.21 by mtbRc. 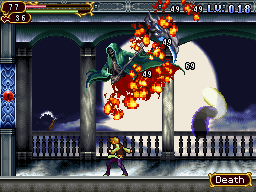 Castlevania: Order of Ecclesia, the third game in the series for the DS, takes a different direction from its direct predecessors in that it is more of a stage-based game, similar to the earliest entries in the series, rather than the "Metroidvania"-style first established by Symphony of the Night. This run plays as Albus, only available as a character after the player has cleared the game as Shanoa. Watch in awe as he beats down this difficult game with reality warping abilities and flaming kicks. Note: This movie starts where a main quest TAS left off. We do not usually accept movies beginning from a save. Please read the rules to see our reasons.